The history of the British Army during the Peninsula War is what legends are made of. The British are often portrayed as gallantly defending a position against overwhelming odds and defeating the French through sound tactics and heroism! Whether it was the lean rifleman in dark green storming the breach at Badajoz or Captain Ramsey saving the guns at Fuentes d'Orono, the British are always come through in the end. These legends are the basis for two of the most enduring myths of the Napoleonic Wars. The first is that the British Army was never defeated in the Peninsula, while the second exist in various forms as either the British Army under Wellington never lost a gun in action or that the Royal Horse Artillery never lost a gun during the Napoleonic Wars. While there is some truth in these statements, they would only be true if we ignore the bloody combat that occurred on 11 August 1812 at Majalahonda, Spain. "We had a devil of an affair on the evening of the 11th. The French, 2000 cavalry, moved upon the Portuguese cavalry; D'Urban ordered them to charge the advance squadrons, which charge they did execute as they ought, and they ran off, leaving our guns... We ... lost three guns... "
So what really did happen at Majalahonda? Could the myths and legends be wrong? Did troops under Wellington's command lose a fight? Did the British lose their artillery? Or was Wellington wrong? The truth is quite interesting. The situation in Spain during the summer of 1812 was not good for the French. Earlier in the spring, Allied forces under the command of the Duke of Wellington had captured the strategic fortress cities of Ciudad Rodrigo and Badajoz, the last French strongholds along the Spanish-Portuguese border. On 22 July, Wellington crushed the French Army of Portugal, under the command of Marshal Marmont, which opened the way for the liberation of Madrid. After consolidating his position, Wellington began to drive on Madrid. D'Urban's mission initially was to act as the vanguard for the Army as they pursued the defeated French. 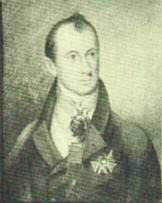 However, upon reaching Segovia on 4 August, D'Urban was ordered to halt until Wellington decided what to do next. On 6 August, D'Urban was ordered to seize the Puerto Guadarrama, the main pass through the Guadarrama Mountains, which laid between the Allied Army and Madrid. On 7 August the advance guard moved out expecting the French to be holding this key piece of terrain. After a march of almost 30 kilometers, much of which was uphill, the Allies seized the pass after encountering no resistance. Proceeding cautiously on 8 August, D'Urban occupied the Spanish summer palace at Escurial and on the 9th, pushed out of the mountains towards Las Rosas. D'Urban was well in front of the British Army, which was strung out for many kilometers on the road from Segovia, and at least one day's march behind. Wellington was concerned that D'Urban would get too far in front of his supports and ordered him to slow down until the main body could get closer. D'Urban advanced about 8 more kilometers and halted his force at the Guadarrama River before the Retamar Bridge, just short of Las Rosas on 10 August. This was about 40 kilometers in front of the main body of the Allied Army. Bivouacked in Las Rosas was a brigade of French Dragoons (13th and 18th Regiments) of about 700 men, under the command of Colonel Marie-Antone Reiset, the commander of the 13th Dragoons. "We advanced and they retired over nearly two leagues of ground, the Colonel constantly asking me if they were within range, to which I replied, 'no sir, no.' At length I asked him if he would allow one of his regiments to accompany my guns to the top of a hill down which the enemy's cavalry was then going, and to this he immediately agreed. Off we set at a trot, from that to a gallop, then to speed, and reached the hilltop just as they got to the bottom, opened fire and put them to flight in style; they made for the town of Las Rozas and drew up to make a stand, but we advanced and drove them through he town. Soon after Macdonald with two guns came up and took command of the whole troop. We then again advanced and drove the enemy for nearly half a league before us, when they made another stand. I went on with two guns and moved them from their position, and after firing six or eight rounds they retired altogether, leaving us about half a league beyond the town of Majalahonda." The French retired and the British loss sight of them. At 10:00 a.m. General D'Urban ordered the Portuguese troops and the artillery back to Majalahonda, while the KGL regiments were halted in Las Rosas, about 1 kilometer to the rear. A small piquet was placed out and the rest of the troops were ordered to stand down, cook their noon day meal, and rest. The advance guard would wait until the main body moved up. The Allies were so confident that the French had left, that they acted like there were in a rear area rather than as an advance guard. Officers dispersed to find places to sleep, horses were unsaddled and some were even being shodded! Furthermore, in the case of the artillery, their commander left no word where he could be found! "...our Commissary came into the room and said, 'they say the French are coming on again.' I took this very quietly, but rather hurried my dressing. In a short time a Portuguese officer put his head into the window, frightened out of his life, and stuttered out, 'Muito grande a feroz cavaleria franceza — vega, vega pela janella, Senhor Capitao — com os suos canoes, muito brava, brava, brava;' this not any language, not a word spelt right, but I give it you as it struck the drum of my ear at the time. As soon as he had taken his departure, I put my head out of the window and sent a man to tell the trumpeter to 'sound out' immediately. All the horses were in the stables; some of the men drawing rations, others getting their horses shod, etc; however, considering everything, they go to the alarm-post astonishingly soon. Not a soul knew Macdonald's house, nor could he be heard of in any direction; so as soon as two guns were ready, my friend Harding and I went away with them at score to the front and directed the rest to follow. Just as we got clear of the town Macdonald joined us, he had been asleep in his quarters and by great luck the noise awoke him." The French advanced in three lines, with each brigade forming one line. Colonel Reiset's Brigade (13th and 18th Dragoons) were in the front, followed by the 19th and 22nd Dragoons, with the Italians and the Westphalians forming the third line. 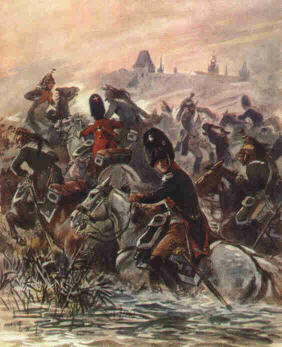 "...sent back messengers to hurry up the German dragoons, [in Las Rosas 1 kilometer to the rear] and took position in front of Majalahonda, throwing out one squadron [from the 11th Portuguese Dragoons] in skirmishing line, deploying five more in line of battle (1st and 12th Regiments), and keeping one [the second squadron of the 11th Portuguese Dragoons] in reserve on his left flank to cover four horse artillery guns there placed [under the command of Captain Dyneley]. 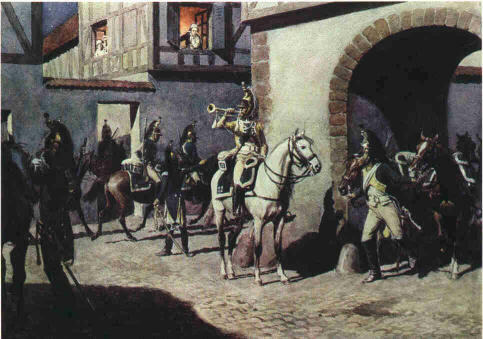 Here also were placed a party of forty of the German Dragoons, who had been sent out on exploring duty." Although, outnumbered by almost 3 to 1, General D'Urban ordered his cavalry to charge. At first all went well, but, when the Portuguese were within about 20 meters of the advancing French, they wheeled about and fled in panic "...leaving their brigadier and their colonels, who were riding well in front, actually in the French ranks. D'Urban cut his way out — the Visconde de Barbaçena and Colonel Lobo were both severely wounded and taken prisoners." The French vigorously pursued the fleeing Portuguese, who swept away the reserve that was protecting the guns. "...turned to Harding and said, 'The French will most certainly turn our right flank, I hope the guns there will be able to get away.' By this time the French cavalry had gained much upon us and the cowardly scoundrels of Portuguese put about and set off as hard as they could go, leaving only 20 of the German cavalry to protect us. We of course limbered up and away we went at speed... by the time we had galloped 300 or 400 yards, the confusion became very great, the Portuguese had given way in every direction and were flying before the enemy who were close upon our heels. At this time I was galloping about a dozen yards in rear of the last gun, and had continued about a quarter of a mile further when, whether my horse made a trip, or whether one of the cowardly scoundrels in crossing me upset him, I know not, but certain it is that we came head over heels together, and away he went leaving me upon the ground. I was hurt a little by the fall and had one of my shoes nearly torn off my foot. How I escaped being ridden over I know not, for the dust was so great it was impossible to see a yard before one; however, as soon as I got upon my feet and had run about 50 yards, I found the enemy had got in upon one of our right guns, and I saw them cut the drivers from their horses. I thought I had no business there and so ran on and came upon the second right gun which the French had been at; the three drivers were lying dead by their horses' side. I then returned, when I discovered the gun I had left was not in the hands of the enemy but had been upset, and our poor fellows, my friend Bombardier Morgan at their head, had dismounted to right it. I went towards them, but before I gone many yards, I heard a terrible shriek of 'Avanti Avanti, ah traditor inglese,' I looked behind me and discovered about four squadrons not more than 50 yards in my rear. The officer commanding them rode and made a cut at me but I made my bow and escaped. As soon as he could pull up his horse he came at me again. When I saw this I sang 'Ufficiale inglese prigioniere,' he then came up brandishing his sword over my head, saying 'Mia dia la sua spada, Mia dia la sua spada,' all I had to say on this subject was 'si, si, si.' "
The detachment of KGL Dragoons under Lieutenant Kuhls that were supporting the artillery fought desperately to save the guns, but were soon overwhelmed and they too retreated. Lieutenant Kuhls, despite being wounded three times, and his remaining 20 troopers were able cut their way through the French and race to Las Rosas. Three British guns were left behind to the French. "...little anticipating any demand upon their services ...were quietly occupied with their stable duties in various parts of the village, many of the men in their shirts and trousers. Kuhls had sent in several reports of the enemy's movements, but colone de Jonquiéres, relying upon D'Urban's cavalry, and the orders which he had received, made no preparations to meet an attack, and the brigade was completely surprised. The alarm was sounded; — two companies of the light battalion which were stationed in the lower part of the village, soon stood to their arms; — the dragoons hastened to saddle, and every exertion was made on the part of the officers to receive the threatened onset. But the German troopers were too dispersed to admit of any effective number being soon assembled, and although captains von Reitzenstein and Marschalck with wonderful activity and presence of mind, brought together a few men of their squadrons, and bravely meeting the French horsemen, attempted to check their progress at the entrance of the village, they were overpowered by numbers, and the elated enemy, following up their successes at a rapid rate, crowded into the place, and appeared suddenly in an open space which divided the upper from the lower part of the village. Here the main body of the first light battalion, together with the baggage of the whole was stationed, and the French riding wildly about, caused great confusion, took some prisoners, and wounded seven men of the battalion; but the companies quickly formed in the open space and drove back the horsemen." 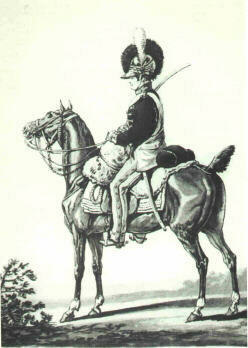 Reiset and his dragoons retreated from Las Rosas and reformed a short distance away. The KGL Dragoons quickly formed up on the outskirts of the village and were joined by the Portuguese under D'Urban on their left. Both forces charged, but once again the Portuguese dragoons refused to close, turned about, and fled. Despite this setback the KGL held their own. 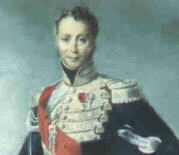 General Treillard committed his second brigade of dragoons who overwhelmed the KGL and captured their brigade commander, Colonel de Jonquiéres. The French were checked at the outskirts of Las Rosas, by the KGL 1st Light Battalion, which had taken up defensive positions in the buildings on the edge of Las Rosas. About this time, General Treillard received word that British re-inforcements were approaching and wisely decided to call it a day. The British advance guard was severely mauled at Majalahonda. In less than an hour, they lost 200 men killed and wounded, 3 guns captured, while one of their two brigade commanders (Colonel de Jonquiéres), and two of their five regimental commanders (Visconde de Barbaçena and Colonel Lobo) were made prisoners. The French abandoned the 3 guns after burning the carriages. French casualties were probably half that, with one officer killed and 15 wounded, including Colonel Reiset. "I have ordered that they should not again mount a horse or wear a sword till they may, by coming near the enemy, have an opportunity of redeeming their credit... till then, hanging their swords on their saddles, they lead their horses, marching themselves. The Portuguese have a good deal of feeling and pride, and it is the only way to work on them..."
"As for sending the cavalry to the rear that is impossible at the present. We have still a good deal upon our hands, and we are worse provided with cavalry than our neighbours; and a body commanded by such a man as D'Urban, even though they will not fight, are better than none. In fact, they behaved infamously, and they must not be employed again alone, or with our cavalry, who gallop too fast for them." Beamish, N. Ludlow. History of the King's German Legion London : Buckland & Brown; 1993. D'Urban, Benjamin. The Peninsular Journal, 1808-1817 London : Greenhill Books; 1988. Dyneley, Thomas. Letters Written by Lieutenant General Thomas Dyneley While on Active Service between the Years 1806 and 1815 London : Ken Trotman; 1984. Napier, William. History of the War in the Peninsula and in the South of France London : Constable; 1993. Oman, Charles. A History of the Peninsular War New York : AMS Press; 1980. Swabey, William. Diary of Campaigns in the Peninsula for the Years 1811, 12 and 13 Cambridge : Ken Trotman; 1984.